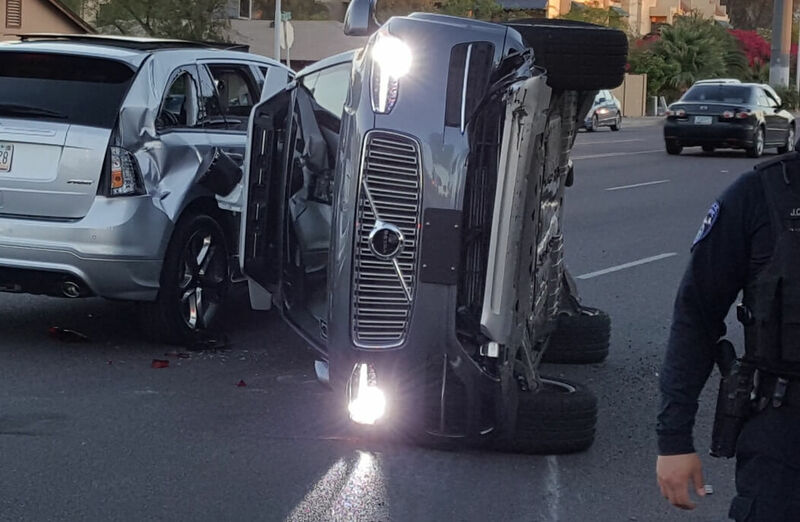 It’s only been four days since Uber suspended its self-driving vehicle program, the response to a crash in Tempe, Arizona that saw one of its SUVs flip on its side following a collision with another vehicle. But the ride-hailing firm is wasting no time getting its fleet back on the road. An Uber spokeswoman confirmed testing has already resumed in San Francisco. Tempe police say the Uber vehicle was not at fault. The human driver of a Ford Edge had failed to yield to the self-driving SUV before hitting it, causing the Volvo XC90 to flip on its side. A driver and an engineer were in the front seats, while the back seats were empty. A full report on the crash is expected sometime this week, said Detective Lily Duran of the Tempe Police Department. Uber decided to halt all autonomous vehicle testing temporarily while the investigation took place. The San Francisco SUVs were allowed to resume their tests first as there are just two cars in the city, neither of which pick up passengers - the program is still in development mode since Uber was allowed back. Uber's self-driving experiment has been far from smooth sailing. The vehicles were banned from San Francisco in December because Uber didn’t apply for testing permits, though they were recently allowed to return after the company decided to follow DMV rules.